In my early years I hadn’t quite developed the empathy required to buy gifts for people that they actually wanted. Growing up I had regular stays with my grandparents and we went to the same sweet shop where I would spend some of my pocket money buying plastic jewellery for my Mum. She was very patient but the final straw came when I arrived home with a pair of red plastic triangular earrings – she never wears red – and she kindly suggested I shouldn’t spend my money on buying her gifts. As the years passed I honed my gift-giving skills and now take huge pleasure in planning, list-writing, seeking out (this doesn’t always mean buying) and giving the perfect present. I don't like to buy something for the sake of it, after all, giving a present is adding to someone's stockpile of goods and chattels and I want it to be a beneficial addition that brings joy rather than being burdensome or wasteful. I try to take a measured approach, but sometimes even this has its challenges. Every year I have a long list of people to buy for but each branch of my family tree has different expectations when it comes to gifts. Some place the emphasis on the cost of the gift (I’ve often been asked ‘how much did this cost then?’) whilst some value volume and fun - they love the thrill of opening dozens of entertaining gifts in one sitting. My Mum has a different style and thoughtfully passes on items already in her possession. She has some gorgeous things that over the years she’s loved but no longer needs or that she’s inherited but are not useful to her. She has given me gold earrings and a beaded evening purse from the 1950s, both of which had belonged to my Grandmother, as well as some wonderful wine glasses given to my parents on their wedding day. This is a truly considered approach and in this current climate of excessive consumption it is one that makes total sense. I don’t need my Mum to spend money on me for me to feel grateful and happy for what she has given me. Plus we can enjoy talking about the story behind the gift – not something that can generally be said of a rushed purchase from Amazon or desperate Christmas eve shop on the high street. I always try to be open and on the lookout for gifts at all times. I am a great lover of charity shops and they are treasure troves when it comes to finding unique, personal gifts. Thinking purely about fashion related presents, vintage clutch bags, jewellery, scarves (also great as gift wrap), belts and cardigans are abundant. If you’re looking for gifts for someone who loves sewing or knitting, you can often unearth a wealth of textile related treasures such as buttons, ribbon, fabric, knitting needles, books and patterns. A lot of Oxfam stores have a small range of haberdashery as well as books on fashion, upcycling and sewing. 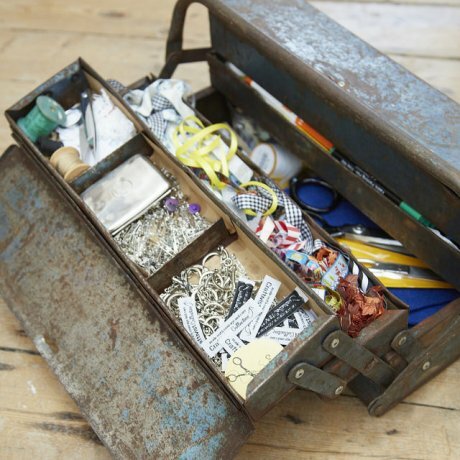 Fill a vintage tin with beautiful bits and bobs and you'd make someone very happy! Vintage boutiques, markets, car boot sales and even kilo sales are great places to find interesting, thoughtful, one-off gifts. I recently went along to the Fashion Salvage Kilo Sale at Bristol Textile Recyclers and came away with some brilliant presents including a shirt for my husband, a coat for my son and an Oscar de la Renta silk scarf which would make an amazing gift (if it wasn’t staying firmly in my possession!) You can make a list in advance to focus your search or just go with an open mind and see what gems appear. There are some fantastic online fashion boutiques and haberdashers that source original ethical gifts and most tell you about the producers too so you can pass that story on when you hand the present over. Have a look on our Long-Life Style Directory for inspiration. 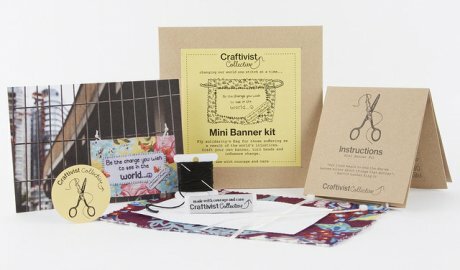 For smaller creative gifts check out the Craftivist Collective's shop and for a thoughtful, free gift you can download our very own Sew It Forward gift voucher and with it give the gift of your time and skills (see the bottom of the post). This year I’m unusually disorganised and haven't bought anything but I feel really quite calm about that. Maybe it’s moving to Bristol where the pace of life is less frantic than London, maybe it’s having a toddler (since becoming a Mum my priorities have changed) but I’ve definitely chilled out. Finding lightness by releasing the hefty weight of perfectionism. Working out which things we truly love and (when we can) letting go of the rest. The guide clarifies my thinking about what gift-giving should really be about and I highly recommend having a read. 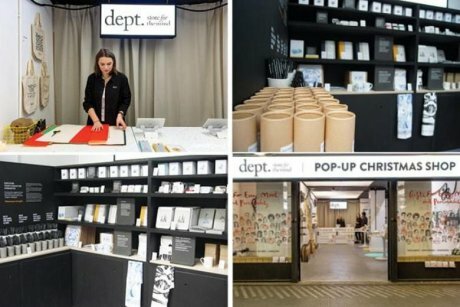 If you’re in London this weekend you could even visit their Pop Up Christmas Shop: 'Pop in to our pop up for space to think, ten deep breaths and a few meaningful gifts to reach out to those you love'. 'Free space and slow shopping guide in store'. A delightful range of mindful, meaningful gifts is also available from Department Store for the Mind's website. If you are in Bristol this Saturday and fancy a bit of alternative Christmas shopping then head down to Bristol Textile Recyclers. I can’t promise you’ll find peace or avoid the crowds (these popular sales are no secret) but you’re very likely to discover something special. They take place monthly so if you can't make this one then check on their website for next year's dates. Find you nearest shop here or shop online. You can download a pdf of the voucher below and give as a standalone present with the promise of sharing your skills, or team with a set of sewing supplies or a kit from Craftivist Collective.